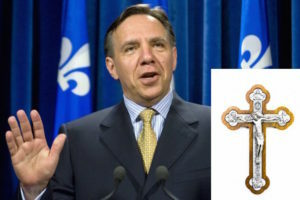 Simon Jolin-Barrette, a spokesman for the transition team, said Tuesday there is no contradiction between the new government’s plan to impose strict secularism rules on certain public servants and its desire to maintain the crucifix. He says the crucifix, which has hung in the national assembly since 1936, is “part of our history” and “an accessory” to the issue at hand. Let me be clear, though: Even if he were to remove the cross, that wouldn’t make the ban on religious headwear any more acceptable. The state should be neutral. That means respecting every individual’s freedom of religion. For the state to be gender neutral, that wouldn’t require all representative of the state to be genderless. Nor would the state being racially neutral require all representatives of the state to have no racial background. The number of people who want to remove people’s religious freedom in the name of protecting religious freedom baffles me. Banning people whose religions require them to dress a certain way from holding positions of authority is exactly the opposite of neutrality. It’s state-mandated atheism, which is no different from any other country that requires or prohibits the practice of certain religions. That’s the true hypocrisy here.